Another week gone, another pretty mediocre batch of films. I can't remember the last time I was really knocked out by a movie (probably when I saw Black Christmas), but it feels like a while ago. Not much activity in the cinema either this week - the only major new releases are the crappy looking new Three Musketeers movie and the new Morgan Spurlock documentary about product placement. Still, next weekend We Need To Talk About Kevin and Contagion come out, so there's something to look forward to after all. (Postscript - I watched The Kids Are All Right after writing the above paragraph - I wouldn't say it knocked me out, but it was definitely a good movie, and a cut above the others I saw this week). Bridget Fonda and Jennifer Jason Leigh star in this decent early '90s 'bunny boiler' thriller. I remember first seeing trailers for this film when I rented a video in about 1994 (maybe The Fugitive? ), but it's taken me 17 years or so to get around to watching it. That might be some kind of record. The storyline for this one involves Fonda's Manhattanite breaking up with her philandering boyfriend and looking for a new roommate to take his place in her big apartment on the Upper West Side. Unfortunately for her, JJL answers the ad and moves into the flat. She at first seems to be good natured, if a little kooky, but it becomes increasingly apparent that she's somebody Tony Soprano would refer to as 'wackadoo'. There's nothing particularly original or groundbreaking about this one, but it features strong performances from both the leads. Bridget Fonda displays a winning combination of confidence and vulnerability, while Jennifer Jason Leigh plays her character is such a way as to be able to engender some audience sympathy for what could otherwise have been a rather one note villain. I'm not sure it was quite worth waiting 17 years for, but it's entertaining enough all the same. I'm never quite sure what to make of Banksy. On the one hand, quite a few of his pictures are amusing, and he's done his bit to put Bristol on the map. On the other hand, I find all of his outlaw posturing is a bit annoying - now he's an celebrity artist selling his works for hundreds of thousands of pounds a pop, his claims that he's some kind of renegade outsider seem a little unlikely. (I should mention I really liked Charlie Brooker's old article on Banksy, even if he was a bit harsh - http://www.guardian.co.uk/commentisfree/2006/sep/22/arts.visualarts?INTCMP=SRCH). Rather than focussing on the life and times of the elusive Banksy, this documentary looks at the works of one his acolytes, a French emigrant to Los Angeles named Thierry Guetta. Guetta begins the film as an aspiring filmmaker chronicling the street art scene in LA, but with Banksy's help, he ultimately progresses to making his own (highly derivative) artworks as 'Mister Brain Wash'. 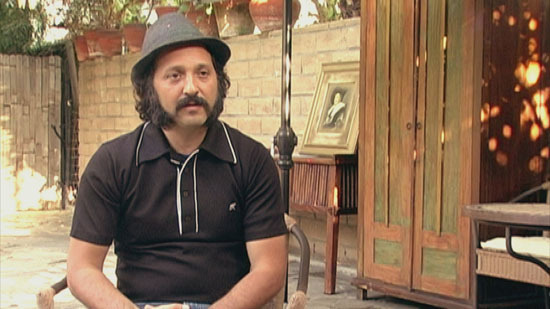 A number of critics at the time the movie came out speculated that Thierry Guetta was just an invention of Banksy, but apparently he's real (and his art is really is far from spectacular). The movie tells an interesting story (courtesy of some wry narration from Rhys Ifans), with plenty of twists and turns, and although it's a little slight, it never outstays its welcome. I just wish there had been a longer look into the works of the LA street artists, and little less focus on the works of Mr Guetta. In which Robert Duvall and Sean Penn take on the Crips and the Bloods in '80s Los Angeles. 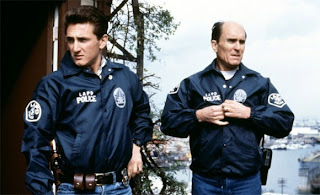 Robert Duvall plays Bob Hodges, a veteran of the LAPD who's realised from bitter experience that LA's gang problem is far too large for the actions of one police officer to have much of an impact. He's an advocate of playing the long game, getting to know the people in the crime riddled areas he's policing, in the hope that they will share information on local gang ringleaders. His new partner, Danny 'Pacman' McGavin (Sean Penn) is a hotheaded rookie looking to bust some heads and take some names (and so forth). I'm afraid that watching The Wire has pretty much spoiled me from enjoying this kind of movie too much. Being able to take its time to tell the story over 13 episodes a season, the HBO series was able to look deeply into both gang culture and the police force, and in comparison, a two hour movie like Colors is pretty shallow. In any event, this isn't a particularly strong example of the genre. The 'mismatched partners' trope is a bit of a cliche, and has been done elsewhere far better. Though there are strong performances from the likes of Duvall and Don Cheadle (as a glowering, charismatic gangster), I wasn't too impressed with some of the other actors, particularly Damon Wayans, whose fast talking idiot is incredibly irritating. Not really one I'd recommend - for better examples of this genre, I'd go for Clockers, Boyz N The Hood or Fresh. Another Bridget Fonda movie from 1992, though this one is a little more lighthearted than Single White Female. It's a comedic look at the lives of a bunch of young people living in Seattle in the early '90s, when grunge music was in full swing. Although it's an ensemble piece, the characters who we get to know the best are a verbose highway planner (Campbell Scott), his female counterpart, who works for the environment agency (Kyra Sedgwick), his former girlfriend (Fonda) and her current beau, a dopey grunge frontman (Matt Dillon). The movie has it's upsides (it's sporadically funny and the soundtrack features songs from Screaming Trees, R.E.M., Mudhoney, Pearl Jam, Alice In Chains etc. ), but I felt unable to really care too much about these characters. The script (by Cameron Crowe, who also directed) felt like he was trying a little too hard, and at times I was very concious that I was just watching an actor try too hard to breathe life into some unnaturalistic dialogue, rather than actually believing in the characters and the story. 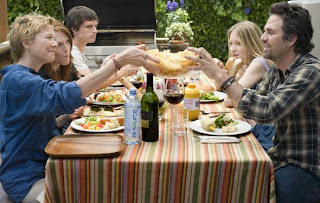 As far as Cameron Crowe movies go, it's passable, but it certainly isn't on a par with Say Anything. A very modern family comedy drama - in which Julianne Moore and Annette Benning play Jules and Nic, a lesbian couple who are the parents of two high school age kids. Their lives are fairly settled, though the long term relationship between the two has become a little strained.When the kids make the decision to contact the sperm donor who was her biological father (played by Mark Ruffalo), and he starts to play an ever more important role in their lives, their cosy domestic situation is shaken up... In sharp contrast to Singles, the script here is very funny, without ever straining too hard. I really believed in the characters - Mark Ruffalo, Julianne Moore and Annette Benning all give highly accomplished performances and bring them to life as fully realised individuals. It all worked so well that I felt a little disappointed at the end - I felt like I knew these people, for better or worse - and would have liked to have seen how their lives continued after the credits had rolled. One downside: they never play the classic Who song which shares its name with this film.